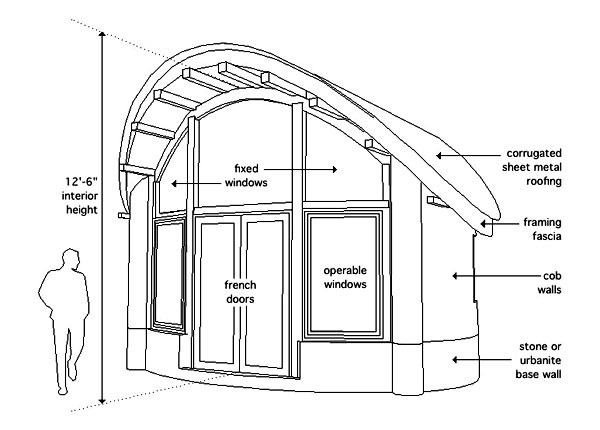 Green Home Building and Sustainable Architecture: Small Cob Buildings without Permits! I would like to introduce you to a new member of the team of architects and designers at www.DreamGreenHomes.com: John Fordice. He is presenting a series of small (under 120 sq. ft.) cob homes or studios that can be built in most localities without the need for a building permit, because they fall below the minimum square footage that is set by the standard International Residential Code. 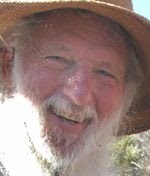 I met John at the 2008 Natural Building Colloquium in Santa Barbara, California, and instantly recognized his gentle soul and passion for designing and building small cob structures. I invited him right away to join the DreamGreenHomes team, and am very pleased that he has climbed on board. John combines his architectural expertise with his sculptural experience in presenting unique plans that will satisfy on many levels. John says, "Ever since I can remember, I've always loved making things. I've been around building in one form or another for most of my life. I first studied building technology, followed by architecture, then finally fine arts and sculpture. My working life has been in construction, architectural drafting, hand crafts design and production, and for the past almost 30 years professional architecture. About 10 years ago I discovered cob and absolutely fell in love with the mud. Cob is an amazing material which allows an unparalleled simplicity and freedom of design. So here I am offering cob building designs to you. Cob has so much to offer." Building with cob allows the use of local sustainable materials. In many areas the earth at your site can be used and only water, sand and straw will need to be brought to your site to make your cob. The cob is mixed right where you are building and stacked up on an impervious foundation. There are no forms needed to make a cob building. Curving sculptural walls are easily created. Your imagination is set free when you build with cob. The cost of creating a small cob building can vary greatly. If you have an experienced cob builder provide both the labor and materials to construct it for you, the cost should be about the same as a simple stick framed building of similar size. Another possibility is to have a builder do the foundation and roof construction, while you build the cob walls. 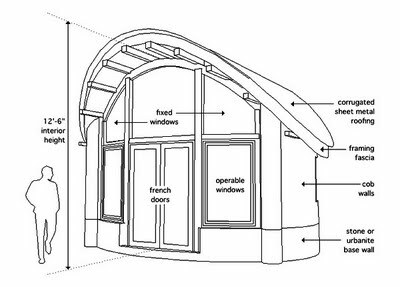 Cob is easy to build, but foundations and roof framing are more technical work which will benefit from expertise. Building your cob structure yourself is by far the most economical. If you can provide the labor to build, and are resourceful in your acquisition of materials, it may be possible to create your cob building for one tenth of what it would cost to have a builder do the construction. It's a big project, but cob is forgiving, and can be done slowly. You can find out more about this specific plan and the advantages of small cob buildings at www.dreamgreenhomes.com. I looks like new york city will be building green soon too.